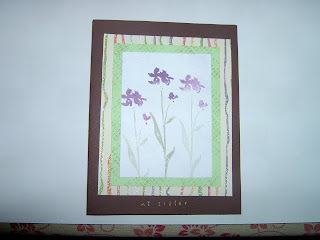 For this card I used my new chocolate chp cs and some glitterpak paper For stamps I used an old hostess set called the art of life. the card is really pretty IRL but I think it needs something but I dont know what. Any Ideas? Thanks for stopping in.. I was hoping to see some comments on this card to see what could be improved. It looks good to me tho. I think the card is pretty...but you can never go wrong with a little ribbon!